Water Use Restrictions: 1 day swimming. 0 Day fishing. 5 day irrigation. 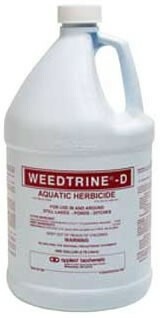 The Weedtrine D Product Label is available for download in pdf. Important: Weedtrine-D Herbicide requires a surfactant. Order Cide Kick when ordering Weedtrine-D.